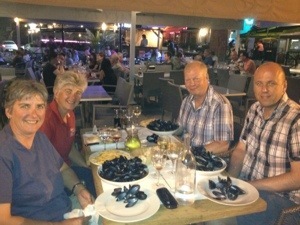 Having spent a peaceful night at Porto Pollo, we got up early to travel the 20nm north to Ajaccio, Corsica’s capital, to meet Colin and Colin, our first set of guests this holiday. The city is on the north side of a huge bay that took us two hours to cross. We had just pulled into the marina when they arrived – perfect timing. As we had arrived before midday, we had to wait for boats to leave so that we could be allocated a berth. So an hour later we were safely moored up and began planning our day. Given all of us had had early starts, we decided on a gentle stroll around the old town and a visit to Napoleon’s apartments. These rooms are a national monument but it wasn’t exactly the most informative of tours. Napoleon was born in Ajaccio but apparently as he wasn’t famous whilst he lived here, he left aged 9, most of the history was conjecture and repetitive conjecture at that. Still, we persevered in the forlorn hope it would improve – it didn’t. 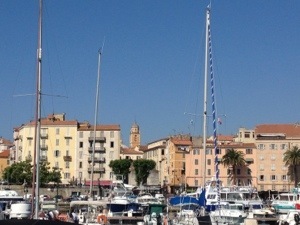 Back on board for a late lunch and a snooze before going out to have dinner in one of the many harbourside restaurants. The benefit of being in the Vieux Port rather than the newer Charles Omano further up the bay. Today we are planning to continue northwards for around 25nm to a small bay to anchor overnight. The weather continues to be very warm at 30 degrees and is already 26 at 0930. 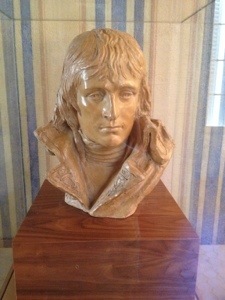 Pictures below of a bust of Napoleon, dinner with the Colins and a view of the old quarter from the marina. This entry was posted in News and tagged 2013, Corsica, France, Med. Bookmark the permalink.